The Origins of Yahweh and the Revived Kenite Hypothesis | Is That in the Bible? The theory known as the Kenite hypothesis is one that has been around since the 19th century, initially proposed by the theologian F. W. Ghillany in 1862. 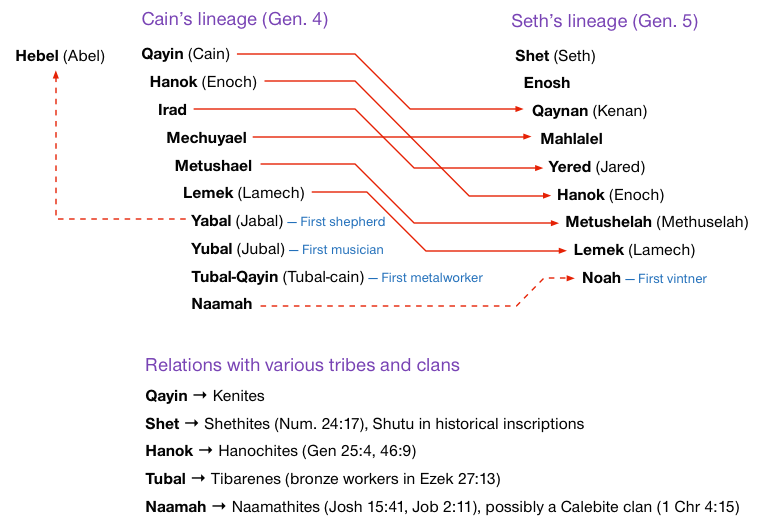 According to this view, Yahweh was originally the God of the Kenite tribe prior to the Israelite settlement of Canaan. The Kenite hypothesis lost momentum as modern biblical studies undermined some of its key premises, but it seems to be making a comeback thanks to newer findings and a reassessment of the biblical texts. In the Exodus story, Jethro, Moses’ Midianite father-in-law, is a priest of Yahweh (Exod 18:7-11) even though he is not an Israelite. By combining this observation with Moses’ “discovery” of Yahweh in Midian and other passages we will look at below, many scholars concluded that Yahweh had originally been a Midianite god whom the Israelites learned about from Jethro via Moses. Furthermore, the father-in-law of Moses is named “Hobab” in Judges (1:16 and 4:11), where he is described as a “Kenite”; this could be harmonized with the Exodus account if the Kenites were a branch of the Midianites. This view of Yahweh’s introduction to Israel became known as the Kenite or Midianite hypothesis. Without a historical Moses and a historical exodus from Egypt, is the Kenite hypothesis still viable? Outside of Exodus, a variety of biblical texts associate Yahweh with the regions south and east of Judah, mountainous areas generally associated with Midian and Edom. He dawns upon us from Seir. Seir is a synonym for Edom, personified as a Horite whose descendants live in Edom in Genesis 36:20. Teman can refer vaguely to the area south of Israel, or more specifically to the area around the Edomite capital of Bozrah. Paran was the wilderness area south of Israel and west of Edom. Archaeological evidence for the name Yahweh is comparatively sparse. The earliest epigraphic evidence (inscription) from Palestine that refers to Yahweh is the Mesha Stele from about 840 BCE. In it, king Mesha of Moab boasts of a campaign in which he devoted the “vessels of Yahweh” to Chemosh after conquering the city of Nebo from Israel. Two Egyptian texts, however, mention “Yhw in the land of the Shasu (nomads)” in lists of toponyms around Edom. These date to the reigns of Amenophis III (14th century) and Ramses II (13th century). It is generally thought that Yahweh must have originally been associated with a mountain of the same name in or near Edom. The early extra-biblical evidence is thus consistent with the possibility that Yahweh was first venerated by nomadic Bronze Age tribes in Edom, and later adopted in Samaria to the north. Chances are most readers of the Bible recall little or nothing about the Kenites. It seems to be an obscure clan that pops up now again in certain stories found in Numbers, Judges, and 1 Samuel. And yet, this tribe gets first billing in the Bible — before Jacob and Esau, and before any of the stereotyped twelve tribes are mentioned — through its eponymous ancestor, Cain. It hardly needs mentioning that Cain and the other eponymous patriarchs in the Bible were not historical individuals, and those who invented and wrote their stories did not think about history the same way we do. The purpose of stories and genealogies written about such characters is to explain the nature and relationships of clans, priestly castes, and nations in the author’s own day. The English spelling is deceptive, but “Cain” and “Kenite” are basically the same in Hebrew — Cain is Qayn, and Kenite is Qayn or Qayni. It is commonly accepted that the Cain of Genesis 4 was considered the patriarch and ancestral hero of the Kenite tribe (cf. Day 336). Like Adam, he is a type of First Man, having been begotten directly by Yahweh at least in some sense (the odd Hebrew of Gen. 4:1 says Eve begot a man “by Yahweh”), and in addition to founding a noteworthy city, his descendants are the progenitors of nomadic shepherding, music, and metalworking. It seems that this was how the Kenites saw themselves — an ancient warrior tribe of Yahweh devotees that lived in tents, played music, and worked metal. Their stories were part of Israelite lore. And then the author of Genesis changed everything: he turned Cain from a warrior to a murderer and reused the names from Cain’s genealogy to create a new genealogy for Seth’s superior lineage. Some scholars even think that in an earlier version of the story, it was Cain who was “the first to invoke the name Yahweh”, an honour now afforded to the obscure Enosh (Wyatt 86). But that’s another story for another article. The point is, the Kenites’ own origin story saw themselves as devotees to Yahweh from the first, even if that fact is obscured by the present text of Genesis. Southern Palestine was quite sparsely populated throughout most of the Iron Age. For example, Broshi and Finkelstein’s survey of archaeological data estimates a total population of about 120,000 people for all of Judah in the eighth century BCE (Iron Age II) (see bibliography below). This is far less than what was estimated by a previous generation of scholars who relied on the biblical narrative of settlement and expansionism — an idealistic reinvention of Judah’s past, as we now realize. The heroine Jael, a nomadic Kenite, helps Israel defeat King Jabin in Judges 4–5. Areas in and around Judah are inhabited by Jerahmeelites and Kenites in the time of David. (1 Sam. 27:10, 30:29) The original capital of Judah where David is made king, Hebron, is also a Calebite city (Josh. 14, Judg. 1:20). Jerahmeel and Caleb are integrated into Judah’s genealogy by the Chronicler (2:9) via Hezron, who is Reubenite in an alternate tradition found in Numbers. The Kenizzites and Temanites are among the Edomite tribes (sons of Esau) listed in Chronicles 1. The Kenites and Kenizzites are listed in Gen. 15:19 as native tribes of the promised land. The background to the Baal Peor incident (Num. 25) appears to be a Midianite-Simeonite marriage alliance (Blenkinsopp 145). The Simeonites’ territory was entirely contained within what later became Judah. From these and other references to Edomite and proto-Arabian tribes in Judah, many scholars have concluded that Judah was settled early on by a loose federation of semi-nomadic clans — Kenites, Kenizzites, Calebites, Othnielites, Simeonites, Reubenites, and so on — and that their settlement traditions were later attributed to Judah (Weinfeld 395). In fact, according to renowned Orientalist Edward Lipinski, there was never a tribe called Judah; the name comes from ’eres yehūdã, meaning “land of ravines” (Lipinski 367). In early biblical stories about the tribes (e.g. the Song of Deborah), Judah is conspicuously absent. Later in the biblical texts, Judah rises in prominence, while the tribes of Simeon and Reuben disappear — even though the fiction of “twelve tribes” is maintained (see my article “The Twelve (or So) Tribes of Israel”). The archaeological evidence is consistent with this view of Judah’s late emergence. There is no evidence for a Judahite state based in Jerusalem until the 8th century; Judah’s first appearance in the historical record is a mention in an Assyrian clay tablet dated to 733 BCE. The tribal god of the ancient Edomites was Qos, who is attested mainly through theophoric names dating back to the 8th century BCE and possibly earlier. Qos, meaning “bow”, was essentially a deified weapon; he was a storm-god and a god of war (see “Qos”, DDD) — just like Yahweh, who himself is associated with a bow in several Bible passages. Furthermore, Qos, Yahweh, and the Canaanite Baal are now thought to have been local manifestations of the ancient Syrian storm-god Hadad (Kelly 260). It must be concluded that either Yahweh and Qos co-existed in Edomite religion, or they were two names for same god (Kelley 266; Blenkinsopp 150-151). It is notable that the Bible distinguishes Yahweh from the gods of other neighbours — the Philistine Dagon, the Ammonite Milcom, the Moabite Chemosh, and so on — but never mentions Qos in all Israel’s dealings with Edom. Edom’s religion is never denounced or rejected. There is even a character named Kushaiah (1 Chr 15:17) whose name might mean “Qos is Yahweh” (Kelley 268). You shall not abhor any of the Edomites, for they are your kin…The children of the third generation that are born to them may be admitted to the assembly of Yahweh. If Judges 4.11 preserves a genuine memory about the migration of Kenites to northern Israel, it is not hard to see how these nomadic groups could have settled in Samaria and introduced Yahweh to the local Canaanite culture. Midianites are portrayed as traders in the Joseph story, and archaeological finds show they had connections with regions as distant as Anatolia (“Midianites”, ABD). Other biblical references support “a series of relationships between the central highlanders [Israel] and southern caravaneers in the Iron I period” according to biblical scholar Mark S. Smith (Smith 145). The inscriptions at Kuntillet ‘Ajrud also suggest that Samarian and Edomite caravans would have interacted with each other on the way to Egypt. Another link between the Kenites and Samaria is the mysterious Rechabites, a nomadic group that drinks no wine and is completely devoted to Yahweh according to Jeremiah 35. A Rechabite also helps Jehu massacre worshippers of Baal in 2 Kings 10, and the group is linked with the Kenites in 1 Chr. 2:55. Yahweh was originally venerated by the nomadic tribes of Edom, either alongside or as another name for Qos. Diverse biblical texts agree that Yahweh originated in the region of Edom, and key figures in the traditions of Judah in particular have Edomite lineages. The Kenites, Midianites, and possibly other Edomite tribes interacted with Samaria through trade and settlement before the state of Judah existed, bringing knowledge of Yahweh to the Samarians. By the time of the Omrides (biblical king Omri and his descendants) in the 9th century, Yahweh had been adopted as the state deity of Samaria, supplanting Baal to some extent. A Judahite state based in Jerusalem was established in the 8th century, and Yahweh became one of the chief gods venerated at the temple in Jerusalem and elsewhere in Judah. John Day, “Cain and the Kenites”, Homeland and exile: biblical and ancient Near Eastern studies in honour of Bustenay Oded, 2009. Karel van der Toorn, “Ritual resistance and self-assertion: the Rechabites in Early Israelite religion”, Pluralism and identity: Studies in ritual behaviour, SHR 67, 1995. N. Wyatt, The Mythic Mind: Essays on Cosmology and Religion in Ugaritic and Old Testament Literature, 2005. Broshi and Finkelstein, “The Population of Palestine in Iron Age II”, BASOR, No. 287,1992. M. Weinfeld, “Judges 1.1-2.5: The Conquest under the Leadership of the House of Judah”, Understanding Poets and Prophets, p. 395. Lipinski, Edward, On the skirts of Canaan in the Iron Age: historical and topographical researches, 2006. Justin Kelley, “Toward a new synthesis of the god of Edom and Yahweh”, Antiguo Oriente, No. 7, 2009. Joseph Blenkinsopp, “The Midianite–Kenite Hypothesis Revisited and the Origins of Judah”, Journal for the Study of the Old Testament, 33/2 (2008): 131-153. Mark S. Smith, The origins of biblical monotheism: Israel’s polytheistic background and the Ugaritic texts, 2005. 2) Another text which connects Cain to the Kenites is Numbers 24:21-22, which predicts destruction for the Kenites: “And he looked at the Kenite, and took up his discourse and said, “Your dwelling place is enduring, And your nest is set in the cliff. “Nevertheless Kain will be consumed; How long will Asshur keep you captive?” Conversely, 1 Samuel 15:6-7 speaks well of them, mentioning an unrecorded act of kindness that the Kenites performed when Israel left Egypt. This theory is compatible with the Kenite hypothesis if the Kenites/Midianites introduced the Levites to Yahweh. 1) Thanks for finding the link. That might even be where I downloaded the article, but I had forgotten. 2) Yeah, I think the Numbers passage in particular solidifies the connection between the Kenites and Edom. Friedman points out that the Song of the Sea, set in Egypt, doesn’t mention all of Israel, while the Song of Deborah, set in Israel, doesn’t mention the Levites. Okay, but the Song of Deborah does mention Yahweh and his origin in Edom. So if we accept the tradition as old, Yahweh preceded the Levites. Having read a whole lot of Thomas Römer lately (and watched most of his Collège de France lectures), I think the exodus tradition is rooted in Egyptian control of Palestine rather than the expulsion of any Canaanites. Combine this with the fact that many Levites–Moses, Phinehas, Hur, etc.–have Egyptian names, and things start falling into place. By a prophet Yahweh brought Israel up from Egypt, and by a prophet he was guarded. I also think Friedman is too beholden to the classical Documentary Hypothesis. The original DH suffers from a certain circularity where the documentary sources are rooted in a fictional past that, if accepted, strongly colours how you view the sources in the first place. However If the Levites were or included Edomite clans that knew Yahweh from an early date, you could include them as a source of early Yahwist religion. Noth and others have thought the Levites were one of the southern clans that initially settled Judah. Paul, did you read beyond my initial post in that thread? I ask because some of your objections–Exodus 4:14, Hosea 12:13 (12:14 in Hebrew)–are answered in my last post, dated 10/13/15. I also provide links to Friedman’s article and video, which I encourage you to peruse. I did skim the rest of the thread, but maybe I failed to grasp some details of your argument. As for Hosea 12:13, of course the traditional interpretation is that “Hosea is talking about Moses”. But what Römer and others have shown is that there is a stratum in the Pentateuch in which the deliverance out of Egypt is attributed directly to Yahweh with no reference to Moses, and Hosea presents an earlier Samarian tradition for which there is no necessity to posit a Moses connection. (Why wouldn’t he mention Moses by name, for example?) And the later authors of the Pentateuch seemingly drew upon Hosea and prophetic language in books like Jeremiah to craft the character of Moses. This is fairly clear from the way they mimic the language found in the prophetic books. Obviously I agree that Levi only became a “tribe of Israel” in later conceptions of Israelite history. I just don’t see how the Song of Deborah could be used as evidence that the Levites brought Yahweh to Samaria if the song knows of Yahweh but not the Levites. Perhaps I’m also less confident that the Song of Miriam is really that early. There are, of course, some scholars that propose a very late date for it. >>>I just don’t see how the Song of Deborah could be used as evidence that the Levites brought Yahweh to Samaria if the song knows of Yahweh but not the Levites. Friedman answers this in the linked video. If you don’t want to watch the whole thing, start at around the 20-minute mark (the whole video is only about half an hour). Habilis thanks you for interesting article. Frank, the name apparently was used as early as Herodotus, 5th century BCE. The main reason I use it is because calling that region “Israel” or “Canaan” has certain implications I’m avoiding. For the archaeological evidence relating to 9th century BC Judah, see https://againstjebelallawz.wordpress.com/iron-age/ . I think there are enough southern fortified cities sufficiently unlike those in Omride Israel and sufficiently like those in later 8th century Judah to suggest the Judahite and Omride states came into being approximately contemporaneously. The archaeological evidence is also (so far) conistent with the Bible’s claim of Edom gaining independence from Judah in the late 9th century. The revelation at the burning bush is a combination of J and E material, with the revelation of the name “I Am” in v:14 coming from E. See e.g. Friedman, The Bible With Sources Revealed pp. 122-123 and p. 875 of The Interpreter’s Bible volume 1. Genesis 4:26 comes from J.
I know Friedman continues to champion the traditional Documentary Hypothesis, but I’m not sure there was an ‘E’ source. What source, then, is behind Genesis 4:26 if not J (unless you think that J contradicts himself about when the name Yahweh was known)?